Title: Saltwater People of the Fatal Shore – Sydney’s Southern Beaches. Cover, Type of binding: Hardcover, case bound, section sewn. 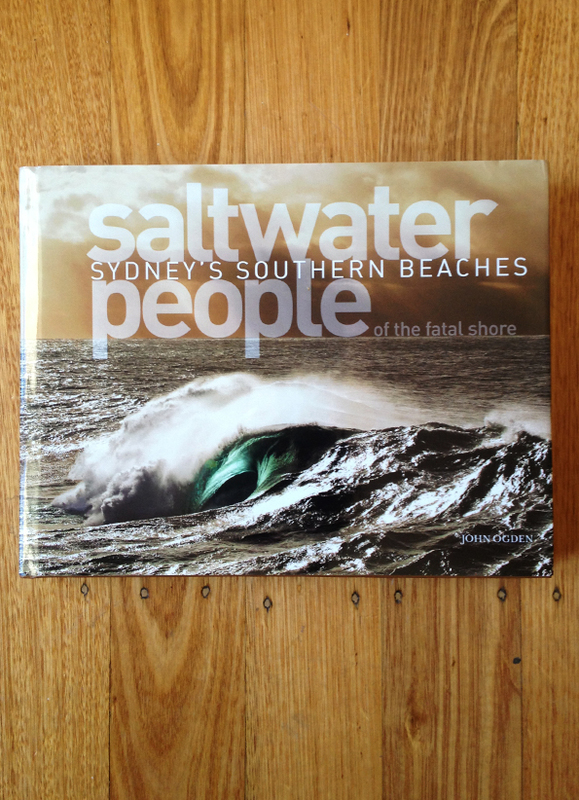 Saltwater People of the Fatal Shore – Sydney’s Southern Beaches is a detailed history of that beautiful stretch of Sydney’s coastline between South Head and Royal National Park. This coastline features world renown beaches such as Bondi, Maroubra and Cronulla, as well as places of great historical interest. Botany Bay was where James Cook first made landfall on the east coast of Australia and made claim to the continent. It was also were the First Fleet arrived with its human cargo. Before these events it was home to the Aboriginal people of the Eora, Dharug and Dharawal nations for tens of thousands of years. The focus of Saltwater People of the Fatal Shore is on the shoreline … that high energy intersection between sea and land where waves, whipped-up by wind and storms, sometimes thousands of kilometers out to sea, announce their arrival in a final dramatic explosion … or caress it with a gentle cascade. This constant, hypnotic dance with the shore can be calming, and it can be confronting. When the swell appears excitement grows and the coastline becomes energized. The surfzone both attracts and influences us … and in turn our presence affects this playground on the edge of the vast Pacific. It is not just surfers that are attracted to this zone. Sydney’s magnificent beaches have produced some truly unique individuals and some incredible stories. They are home of the world’s most recognized painters, potters, writers, poets, photographers, film-makers, musicians and architects. Saltwater People of the Fatal Shore – Sydney’s Southern Beaches pays homage to those remarkable people who have made this coastline home. The many beautiful photographs found in the book include work by Harold Cazneaux, Max Dupain, David Moore, Frank Hurley, Jack Eden, Bob Weeks, Peter Solness, Bill Morris, Brad Malyon and many other great contemporary photographers. When asked, very few people living in Sydney know about the Aborigine people who lived along the coast before the coming of the Europeans. There are also many misconceptions about the culture of the first people. One common belief is that they were all somehow frightened of the ocean, but this is far from the truth. The Aborigine clans along Sydney’s beaches were true saltwater people, at home not only in the sparkling estuaries and rivers, but also in the ocean waves. Theirs was a canoe culture. They fished with spears, or lines and hooks, and were accomplished swimmers completely at home in the surf. This part of our history has remained largely hidden, and it is important to reveal here the influence of our Aboriginal heritage not only the people of Sydney, but also on our national psyche. If we had listened, the Saltwater People would have also taught us much about protecting the coast and its valuable resources. There is now a growing awareness that something is wrong. The natural beauty of the area is under threat. It is obvious that the first people protected this country, and, as they did for many millennia before us, we need to think from the heart and preserve the area for future generations. The foreword for the book was written by the Hon. Linda Burney MP. Upon her election she became the first Aboriginal person to serve in the New South Wales Parliament. Burney, a Wiradjuri woman, is currently Deputy Leader of the Opposition, and is the shadow minister in several key portfolios.